A while back I posted something on an anticipated big change in my life. God has been laying out a theme for me and each day it becomes more difficult to ignore it. The one constant in all the material I am being sent, in each book I decide to read, and most of the blogs I frequent is repentance. It shouldn't be too surprising to come across the word repentance in the Christian world. It is easy to see there are a lot of people out there who need to repent. Now, I could delude myself into believing that God is bringing this idea of repentance to my attention so I can point out the sins and faults of others. You know, like He is grooming me to be a crusader of sorts . That's it! I am being called to start a new club for super-Christians called "Speck Patrol." Ha! I wish. No, the more I try to wiggle out from under the conviction, the more pressure God is placing on me to re-evaluate my concept of repentance. Not mine alone, but how we as the body of Christ view repentance. Sure, we can connect the dots when we fall into one of those big sins we are familiar with, like adultery, murder, and the like. We are fairly quick to repent when we are in crisis. We forget that as we stumble and bump through our day-to-day lives, we Christians need to consider our need of repentance. We need to know what constitutes repentance by biblical standards, and to be able to identify true repentance when we see it. The more I read the more I am convinced that repentance is one of the most neglected necessities for living a fruitful life. Why? Because we don't hear enough about it from our pulpits. The very words, 'repent' or 'repentance' seem to have become obsolete. Instead of being told that the cure for sin is faith in Christ coupled with repentance, we are more likely to hear about our "issues, conditions and syndromes." It is our ADHD or low self-esteem that cause us to behave the way we do. We are victims of our metabolism, cursed by our genetic make-up and at the mercy of our environments. It's garbage, but we like it. We build mega-churches where we can get our egos stroked and our feathers smoothed and we're dying as a result. Unless and until we are ready to cowboy up and take responsibility for our own thoughts, deeds, actions and inaction, we will never enjoy the life-renewing, hope sustaining joy of repentance. "For thus the Lord GOD, the Holy One of Israel, has said, 'In repentance and rest you shall be saved, in quietness and trust is your strength.' But you were not willing" Isaiah 30:15. It's scary and I will be honest enough to tell you that my first inclination is to run away from what God is teaching me about repentance. That's my flesh talking. That's the enemy whispering his poison into my soul. The command in Scripture is clear. We are to repent and believe. Too often repentance is only for those who are being evangelized and are becoming Christians. The truth is that the root of every sin in a believer's life, is the sin of unbelief. If we truly believed God's promises, how would we be motivated to sin? Tell me, what would your reaction be if you were to see a man, freshly deposited from the belly of a great fish, tromp up to you and say; "Repent!" Would you be compelled to do just that or would you want to tell him that you were also believer? Perhaps you would like to chat him up and ask him just what it was like to be in the belly of a fish? No recriminations here. You can see what my reaction is to this material the Lord has deposited at my feet. I have a bit of fear about what I will have to give up, but the knowledge that He has my best in mind is comforting. The book pictured above is is one of the things God is having me revisit, The Doctrine of Repentance. It is written by one of my favorite Puritan authors, Thomas Watson. 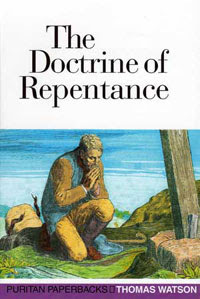 I also want to leave you with a link to his work "The Nature of Repentance." Both are well worth the read. Rosemarie, great post on one of my favorite books by one of my favorite Puritan writers also. Sadly, repentance is a foreign concept to many who occupy pews in churches today. I am amazed, no grieved, by what I seen in many of our churches today that is trying to pass as the Gospel. It is another gospel, which is no gospel at all!! Opps, grammatical error above. In sentence #3 it should read, "by what I have seen." I left out the have. Sorry.